A full service agency specializing in timberland. Features services and listings. Based in Waynesboro, GA. Specializing in ranches, land and homes with acreage. Features property listings and newsletter. Complete forestry management services in addition to buying and selling farm, hunting and timber land. Posts listings and contact information. Bid for properties in different prices ranges, including farm land listings in Minnesota. Offers details on farm, land, and other rural property listings across the US. Specializes in farms, large tracts of land, and residential properties. Featured listings, photos, and contact information. licensed land agents providing complete land consulting service. Offers hunting land across the southeast. Features listings, agents, company profile, resources, and mapping services. Provides land development consulting services for private land developers and land owners in the western region of the United States. oil and gas as well as right-of-way land related activities consisting of several organizations working together to provide unique land consulting and land administrative services. Specializing in cattle, hunting, and recreational ranches plus irrigated and dryland farms. Features listings and buyer agency services. Offers listings of homes and land available by owner or by agents. Specializes in managing, appraising, consulting, and selling farm properties. Features services, listings, current land values, newsletter. A full service real estate company offering residential and commercial properties, farms and ranches, and land. Description of services and property listings. Pacific Northwest land development consulting firm specializing in civil engineering, land use planning, land surveying, landscape architecture design, and project management. Specializes in timber sales, timberland management, land sales, land acquisitions and rural land estate appraisals. Major real estate company, offering services in commercial, residential, and land development. Includes property and project listings and company information. Directory of local communities and pre-owned and new home listings in San Diego County, California. Includes resale listings, new homes and community information. Offering farms, acreages, hunting land, residential, etc. in southeast Iowa and northeast Missouri. Complete pictures, maps and aerial views of all listings. Specializes in farms and ranches in Idaho, Oregon, and Nevada. Features property listings, agents, company profile. Full service land development consulting firm offering professional experience and expertise in municipal planning, land use planning, civil engineering, landscape architecture, and land surveying. Located in Burnsville, Minnesota. Also known as the Egyptian Arab Land bank, was established in 1947 by the Arab League in order to assist the Palestinians in retaining and acquiring land. Organization of professionals specializing in land brokerage. A page of land for sale and the outdoor recreation available in this area. Planners and land use consultants, providing land development services located in Mainland, PA. If the business hours of Georgia - Mike Smith Forestry and Realty in may vary on holidays like Valentine’s Day, Washington’s Birthday, St. Patrick’s Day, Easter, Easter eve and Mother’s day. We display standard opening hours and price ranges in our profile site. We recommend to check out landandtimberinga.com/ for further information. 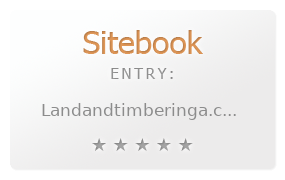 You can also search for Alternatives for landandtimberinga.com/ on our Review Site Sitebook.org All trademarks are the property of their respective owners. If we should delete this entry, please send us a short E-Mail.